On Saturday mornings the Columbia Farmers Market draws thick crowds eager to fill their bags with fresh produce, baked goods, local meats and more. Wandering through is a sensory experience, filled with earthy smells, bright cheerful produce and savory samples. Amidst large-scale farmers, two tents stand out with simplistic beauty. LP Urban Farm sells clamshells filled with delicate microgreens. Nearby, The Grow Bros Natural Farmers have containers filled with the ornate white fans of oyster mushrooms. On occasion both tables display a small selection of other produce; lettuce to make a salad to highlight the micro greens or green beans to serve in a skillet alongside the oyster mushrooms. The primary niche market for both, though, is clear. They began growing the mushrooms about two years ago, but expanded their efforts in the last year. Their product can be found at several farmers markets in Missouri, from Kansas City to Washington. The Grow Bros Natural Farmers also sell their mushrooms directly to a variety of restaurants and catering companies. Oyster mushrooms are versatile, with a milder flavor than some specialty mushrooms. They hold up well in soups or sautéed, though Nathan’s favorite preparation is grilled alongside fresh asparagus. The mushrooms require a different sort of attention from other Missouri produce. Christopher’s garage is filled with bags stacked neatly on custom-built wooden shelves. The bags are in various stages of growth to ensure a steady supply, a range from zero growth to the bags disappearing under the elaborately layered frills of the oyster mushrooms. More information about their mushrooms can be found on www.facebook.com/TheGrowBrosNaturalFarmers. Seth Allen of LP Urban Farm sells nutrient dense microgreens. There is a wide variety: robust sunflower, tangy kohlrabi, heady herbs, spicy radishes and more. “We get to grow lots of cool varieties that have a range of flavor, texture and color,” Allen says. The visual appeal is certainly one of the major customer draws. At the Columbia Farmers Market, people stop because they are intrigued by the unique little plants. Allen sells individual types alongside custom-made mixes, all suited to various dishes and personal palettes. “Everybody asks me what to do with the microgreens,” says Allen. 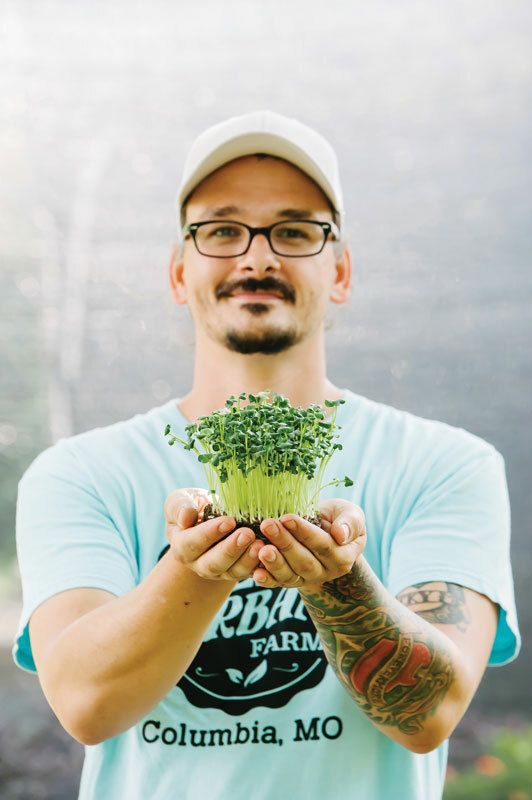 “A lot of people view microgreens as an accessory, but there are all kinds of exciting things you can do.” He enjoys sharing ideas with regulars and new customers alike at his market table. “Microgreens are a little bigger and have a lot more flavor,” says Allen. The microgreens are essentially the stage after a sprout. They are 1- to 2-inches long and include the stem and first set of leaves (cotyledon), but no roots. 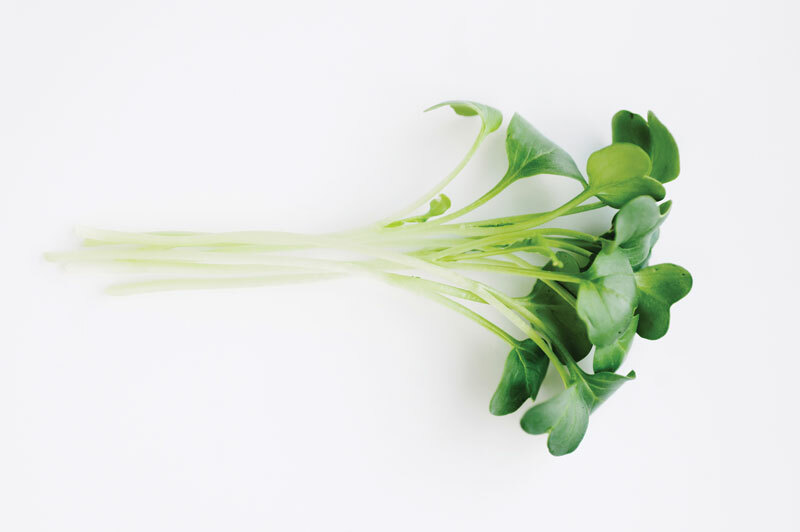 Because microgreens are clipped above the soil growth, they are not at risk for some of the bacteria issues that sprouts are susceptible to. To maximize his plants, Allen seeds his plants directly on top of the soil. They have high nutrient demands from the soil, so every tray gets a fresh batch. The Allen family’s small backyard is evolving with hills formed from discarded microgreen soil. Heads of lettuce and edible flowers peek through landscaping fabric alongside the purple leaves of Japanese Shiso, a unique liquorish/citrusy herb that is excellent for pickling. The outside produce is definitely not the primary focus of Allen’s energy. Inside, he keeps track of the daily needs of the microgreens on a large chart on the wall inside the garage. Similar to Christopher’s garage, Allen has converted the garage with towers of shelves, which are filled with trays in various stages of growth. Lights are mounted on each shelf, allowing control of light and increased warmth. Up high, recently seeded trays are stacked tightly, with young seedlings pushing ever upward. A little more than a year after testing his product on friends and family and an early test Community Supported Agriculture share program (CSA) with only seven members, Allen now has steady business with restaurants including Main Squeeze and Kampai, catering companies, the Columbia Farmers Market and his mini-CSA program. Contact LP Urban Farm at www.lpurbanfarm.com.